We're here if you have a question about availablity or if you'd like to start planning your family's vacation. We try to keep this calendar as up to date as possible. It doesn't guarantee availability, but it should provide a sense of likely availability. Beautiful Mountain View, Steps to slopes, Guest Passes, Escape the Heat! Escape the summer heat at Wintergreen! Typical highs only in the 70s make this a perfect place for outdoor fun. Check out the new slide at Lake Monocan or pamper yourself at the resort spa. Tubing, zipline, archery await at Discovery Ridge. Explore the area with dozens or vineyards, breweries, great dining, historic sites and scenic hikes. Plenty of adventure to choose from! 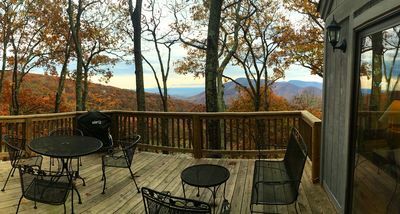 Eagle's Lookout is located in Wintergreen's Treeloft Village, just 100 steps from the ski slopes. Our house delivers year-round Southwest views from almost every room. Adjacent to protected greenspace and actually perched above a scenic overlook, you'll enjoy the incredible sunsets in a quiet, peaceful setting and be the first to take advantage of new snow by rolling out of bed and onto the slopes! In the warmer months, it is also within walking distance of the Mountain Inn, shopping and restaurants, Blackrock Market, the Discovery Ridge Adventure Center and multiple scenic hiking trailheads. You can even watch the 4th of July fireworks from the slopes across the street! All the comforts of home during your mountain getaway... Inside, vaulted ceilings and a wall of windows open the space. The updated kitchen and baths all boast granite counters and new fixtures. The dining area seats 6-7 people comfortably, and the living room features leather seating and a wood burning fireplace for cozy evenings. The master bedroom has a queen bed and private bath, and the 2nd downstairs guest room has a queen bed and bunked single beds. A spiral staircase leads to the upstairs loft bedroom with two sets of bunks and its own tv area with video games. Great for the kids! All rooms have flatscreen cable TVs and WiFi internet is included. We constantly strive to improve Eagle's Lookout. New in 2015, guests will really appreciate our enlarged back deck, with a new gas grill and gorgeous year-round view! And a heated mudroom addition, completed in 2011, provides a washer/dryer & plenty of room to suit up for the slopes and store all your gear out of the way. This is a feature very rare in Wintergreen slope side houses! Planning ahead? We have the perfect winter location! Our home is across the street from the Eagle's Swoop run at the top of the Big Acorn Lift. This ski area is rated intermediate. Eagle's Swoop is one of the first runs to open each season and operates for both day & night sessions. It is only about a 2-minute walk to the slope… Easy to stop home for cocoa or ski to the Mountain Inn for dinner, yet far enough so you won't be bothered by the snowblowers and night skiers in the evenings. Enjoy Wintergreen Resort… so much more than just a winter getaway! It is a multi-seasonal family destination comprised of 125 acres of skiing, championship golf courses (18 holes on the mountain, 27 in the valley-open year round! ), a nationally ranked tennis program, Wintergarden Spa, summer music festival, 30+ miles of hiking trails that connect to the Appalachian Trail, indoor and outdoor swimming pools, fishing, kayaking, and relaxing at Lake Monacan beach. Guest of Member passes available to access golf and the Wintergarden fitness center/pools (Resort guest fees will apply). Come and enjoy! We love the mountains, any time of the year! Eagle's Lookout is not just a rental, it is truly our home away from home and we visit frequently. Unfortunately we can't live there full-time (yet! ), so we're happy to be able to share the house with others who will equally appreciate our peaceful mountain getaway. Wintergreen Resort has so much to offer year round. Our location is perfect for skiers in winter and hiking spring-fall. Easy access to the many resort amenities. But hands down, we choose this house for the mountain views! Really, sometimes we just prefer to spend our time relaxing and enjoying the view from the deck or couch! With two teen children of our own, the house is perfectly set up for 1-2 families, with a separate space for the kids to hang out in the loft. Older children can come and go as they please and hit the slopes or the adventure center on their own while the parents relax. Year round mountain view from main living spaces and master bedroom. Easy, 50 yard walk to the slopes. Quick, 50 yard walk to the slopes. Guest passes to access Wintergarden fitness center/indoor pool. Free access to two area outdoor pools in summer. Hot Tub and indoor pool located at the Wintergarden Aquatics and Fitness center. Perfect location for the slopes! We loved our weekend at Wintergreen! Our family of 5 really enjoyed our stay. We had never been to Wintergreen before and this house was the perfect solution for our family - within steps of the ski hill and centrally located. It has gorgeous views and is comfortably appointed and beautifully decorated. We took advantage of the fully stocked kitchen to make our own meals (rather than go out), so I can't comment on the restaurants in the area. We would definitely stay again! This is the second year we have stayed at this home. It’s a great house with everything you need. We love the location near Big Acron Quad Lift. The lift is just up the street. And they are dog friendly which is important to us. Kathryn kept us informed of everything going on at Wintergreen. We hope to stay there the next time we go to Wintergreen! Wonderful stay! We will be back. The views are absolutely fantastic from this house! The views may be the best in the whole resort! The house is very nice with a wood burning fireplace which was a treat. Great hiking close by and the spa/pool at Wintergreen was great. The only negative was a larger hot water heater would be nice, but that is minor considering the fantastic views and location. We booked this for my wife's birthday and were so excited to get away. Every step in the process went perfectly, the owner responded quickly and was accommodating. Everything was perfect....except the weather. It was a rainy, foggy, drizzly, yucky kind of weekend. Which made our stay even better. Since we didn't want to drive in such bad conditions we stayed home. We cooked homemade soups and chili, played board games and enjoyed each other's company. It was perfect!!! There was plenty of firewood, the kitchen has almost everything you could ask for (need a potato masher). It is a great house with what I am certain are great views. Comfy beds, very clean and easy to get to. We look forward to coming back. Inquire about mid-week or last-minute discounts! A 3-night minimum stay will apply all non-holiday Jan/Feb weekends. Minimum stays may be waived for last minute or mid-week reservations and in cases when other reservations prevent longer rentals. Weekly rate does not apply to Saturday check-outs. Thanks! A 4-night minimum stay will apply all non-holiday Jan/Feb weekends. Minimum stays may be waived for last minute or mid-week reservations and in cases when other reservations prevent longer rentals. $120 Cleaning fee will be added to stays less than minimum. Thanks! Ask about weekly and last minute discounts!